If you’re visiting Santorini and staying on the island, you’ve already won. Still, there are a few things you need to know when it comes to the vibe of the towns there and how that matches up with what you’re looking for in your vacay. As I was booking a place in Santorini, I was completely baffled by what part of the island to stay in, until I chatted with friends who had been before and stumbled upon SantoriniDave.com, which broke down each part of town and anything else I could want to know about Santorini. I was going back and forth about whether to stay in Oia or Fira on a girl’s trip and I got my answer. I stayed in Fira. 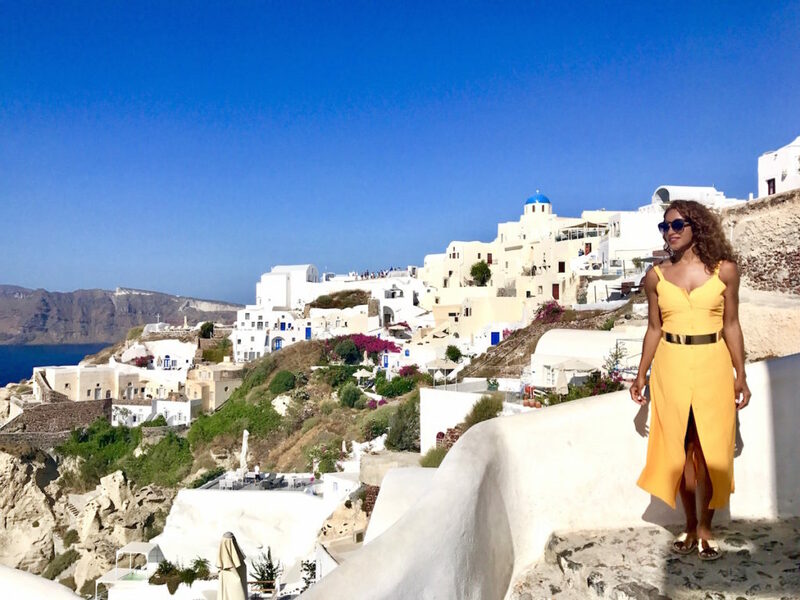 Now that I’ve been to Santorini, I have a better sense of what each major town is all about and am sharing that info with you. Take a peek at our guide on where to stay in Santorini! This is still a tricky one for me. With its picturesque caldera views and endless opportunities for whispering sweet nothings over candlelight, Oia is definitely better suited for couple’s trips. If you’re taking a vacay to Santorini with your beau, stay here. Hands down. Since the views are so incredible, particularly at hotels with caldera views (from their infinity pools okurrr), don’t count it out if you’re taking a girls’ trip to Santorini. I stayed in Fira on my girls’ trip, but when I go back to Greece, I’m going to stay in Oia no matter what for those views alone. Katikies: Three infinity pools, luxury digs, and incredible caldera views…it’s tough to ask for more. This boutique hotel, which sits 300 feet above sea level is very romantic, so if you’re celebrating a honeymoon, an engagement, or just wining and dining with your significant other, this is an amazing place to do it. When they’re not sunbathing by the pool, guests pop into the onsite Seltz Champagne Bar & Restaurant for wagyu burgers, and more, or grab grub poolside (guests have raved about the sushi) at the Katikies Pool Bar. Canaves Suites: We took one look at this infiniti pool and were sold, but the sparkling pool, which has panoramic caldera views and offers plenty of cocktail sipping, is just one of the perks of staying here. Every room, which comes complete with minimalist white and blue decor, has a plunge pool on its balcony that overlooks the Aegean Sea. By day, guests enjoy a champagne breakfast at the Petra restaurant, and at night they come back for dinner and feast on mediterranean dishes. There is also a fairly new spa on the grounds that is tucked away in a 17th century wine cave. *Bonus – If you’re heading to Mykonos soon, Canaves Suites Mykonos opens this month. Perivolas: This luxury 20-room boutique hotel sits on a cliff above the caldera, and has also has an infinity pool that is perfect for sunbathing and cooling off from the heat. Each room, converted from 300-year-old caves, comes with a terrace that has breathtaking views of the caldera at sunset and was designed with minimalist, comfy, Cycladic-style (white walls and splashes of color). The hotel is about a 15-minute walk from the main hub of Oia. Big Tip: There are no TVs, children are not allowed, and getting to the hotel can be a trek given the number of steps along the way. If you’re traveling with someone with limited mobility, skip this one. Known as Santorini’s party town, Santorini’s capital is a great place to stay if you’re looking for accommodations that are more affordable, and you’re traveling with a group of friends. When I traveled to Santorini on a girls’ trip, we stayed here. There is more nightlife here than you’ll find in romantic Oia, and you’ll be walking distance (or a short drive) from livelier bars and a few nightclubs. Fira also has some of the best shopping on the island, and it was easy to get to other parts of the island (Red Beach and Black Beach) via ATV. We thought Fira was one of the least romantic parts of the island though, so if you’re staying in Santorini with your significant other, try Oia or Imerovigli instead. Astro Palace Hotel: We loved this hotel. Tucked away at the bottom of a hill (and walking distance from Fira’s shopping district), Astro Palace had everything we were looking for at a far more affordable price than a stay in Oia. We stayed in a suite that came complete with plush bedding and a private pool, and were greeted with champagne and fresh fruit when we arrived. The hotel also had complimentary breakfast and a twinkling pool that echoed the stars in the sky at nightfall. The only thing missing was the caldera views, but we surprisingly didn’t miss them because of all of the other amenities in the hotel. Cosmopolitan Suites: Not far from the action of the Fira shopping district, this boutique hotel lures in guests with the jaw-dropping views of the caldera from its infinity pool. Guests can enjoy cocktails and light bites from the Cosmopolitan’s pool bar all day and receive complimentary breakfast served in their beds or on their verandas. Rooms are simplistic in design with white walls and white plus bedding, and come complete with walk-in showers that look like they’ve been carved out of a side of a cave. It’s also one of the best hotels on the island for nightlife. *Bonus: The hotel organizes wine tasting sessions for guests. Aigialos Hotel: What began as an 18th century convent is now an upscale hotel that has amazing sunset views of the caldera and delicious grub on site, thanks to its fine-dining restaurant Bougainvillea Scarlet Queen, which serves gourmet Mediterranean cuisine. This group of 16 houses date back to the 18th and 19th centuries and have less of a modern vibe than surrounding hotels. It’s located just five minutes away from Fira’s shopping district, so it’s not too far from the action, but the pool is tiny. While this is a more budget friendly option, if you’re looking for an infinity pool or love to sunbathe, steer clear of this one. There aren’t any loungers by the pool. This is a great option for those who want to be close to the action, but just far away enough that it doesn’t feel like you’re in the center of it. There are no bars or nightlife here, but it’s a short walk to Fira, and a lot of the hotels have fantastic views of the caldera. Even better, most of the hotels with caldera views are on the budget-friendly side. Homeric Poems: This luxury hotel features an infinity pool with views of the caldera, and modern rooms – decorated stylishly with Cycladic-themed decor – that have private terraces with views of it as well. Guests sip cocktails at the bar by pool, and enjoy traditional Greek cuisine at night whipped up by award-winning chef Dimitris Skarmoutsos at the on-site restaurant. As a bonus, Homeric is less than a mile away from Fira. Take a peek at one of the rooms that come with a pool. The Tsitouras Collection: Carved out of an 18th-century Cycladic mansion, this boutique hotel is walking distance from Fira and has an infinity pool with caldera views to die for. Aside from the poolside bar and terrace complete with lounge chairs, there are also plenty of freebies: free minibars, free breakfast served every morning, and a comp cocktail for each guests at sunset by the pool. It’s touted as one of the top hotels on the island. Belvedere Hotel: Like its FiroStefani counterparts that we love, Belvedere also sits on a hilltop and has gorgeous caldera views. It’s walking distance to Fira’s shops and nightlife, has an outdoor pool with views of the caldera, and a wine cellar in its basement. Rooms are decked out in modern white decor and each terrace has an incredible view. Big Tip: There is no onsite restaurant, so you’ll have to head down to Fira for grub (there are cobblestone streets and steps to get to and from the hotel). If you’re looking for a quiet, peaceful stay in Santorini with your significant other, this is it. Known as one of the quietest parts of the island, Imerovigli will make you feel like you’re in a world of your own. Although there’s no nightlife here, the caldera views are incredible, and it’s home to some of the best hotels on Santorini. Astra Suites: Can you tell that we’re all about hotels with infinity pools in Santorini yet? Noted as one of the top hotels in Santorini, Astra Suites has another one that made us swoon. Guests lounge in daybeds and wooden loungers by the pool, which overlooks the caldera, and there is a small spa that features hammam, steam rooms, and treatment rooms. There are four studios on the cheaper side on the grounds, but the other 22 units are suites. A few include private freshwater plunge pools and senior suites have double loft bedrooms. If you love a good pool moment like we do – and can afford to splurge for a special occasion – go for the pool suite, which has a larger pool than the other suites. Cavo Tagoo: This hotel’s sister location in Mykonos helped give it a rep of the place to stay when it comes to luxury hotels with an exclusive – and private – vibe in Santorini. It’s one of the newer luxury hotels on the island (it opened in late 2016), and is tucked away in a quiet area of Imerovigli. According to SantoriniDave.com (one of our faves for guidance on Greece), restaurants are about a 15-minute walk away, but there is also an on-site restaurant, Ovac, which offers Mediterranean fusion grub. Aside from the gorgeous infinity pool, which has panoramic views of the Aegean Sea, each suite comes complete with a private plunge pool or hot tub. The Big Splurge — Grace Hotel: Hands down, this is one of the best places to stay in on the island. Located just a mile away from Fira, this award-winning boutique hotel is all about catering to those who want a five-star luxury experience. The sunsets at the hotel’s infinity pool – the largest on the island – will blow your mind, but that’s just the beginning of the perks here. Everything from poolside drinks to room scents can be customized to cater to hotel guests’ preferences. A champagne breakfast is served daily, and Grace has a champagne lounge, 363, where guests sip bubbly on an all-white terrace. Most rooms also come complete with a private plunge pool and some rooms have their own steam rooms. Have an amazing time in Santorini! ?OMGGG…I am so excited for our trip!